Peter Tilley, Cr Ray Argento, Kevin Flett and Steve Barnes. FOSTER Rotary recently celebrated the official opening of the Loader Walk track at Fish Creek. The track was completed as a way of leaving a lasting reminder of the 50th anniversary (1967 – 2017) of a club that has been essential to the local region. 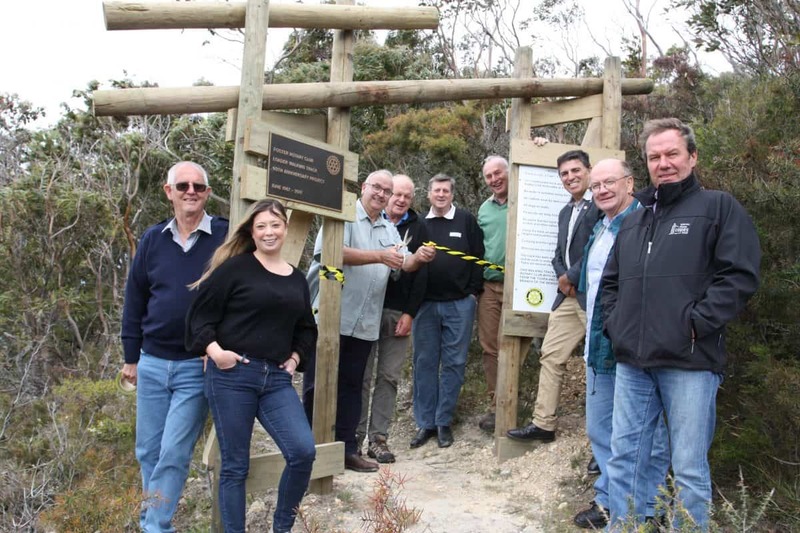 Foster Rotary president Bruce Standfield said the track, funded by Rotary International and the Toora & Foster Community Bank provides wonderful views of Wilsons Promontory and Corner Inlet and is sure to be a tourist drawcard and will help to extend the “Fish Creek walk”. It runs from Fish Creek to Mount Nicoll. “We put in money to improve the walking track across the Hoddle Ranges, which Rotary started off years ago with the help of prisoners and the Shire – putting tracks in, putting a sign up, constructing the Loader Walk,” Bruce said. He said it was a “great community” project. Led by a Rotary-appointed committee of three dedicated members – Bruce Lester, Rod Cooper and Kevin Flett – the project enjoyed the assistance of bobcat operator Terry Williams and surveyor Ed Jensen. Rod Cooper constructed the archway at the beginning of the trail, with Rotary also supplying tables and chairs further along the track. The Loader family, original selectors in Hoddle, were represented by Amanda Loader and Noel Loader.